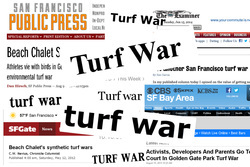 For years San Francisco reporters and editors had been provided with scientific data and been made aware of the problems associated with City Field Foundation's, (CFF), styrene butadiene (SBR) projects. Short sightedness and narrow thinking were encouraged. John Wildermuth of the SF Chronicle portrayed the issue as “kids versus birds”. 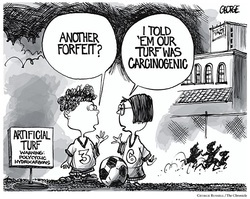 C. W. Nevius sarcastically wrote in his SF Chronicle newspaper column, “The toxins in the artificial turf may poison children, kill and maim wildlife, and leach terrible chemicals into the ocean. That's a good argument - from 1984.” he continued, “Hundreds of thousands of children - including my daughter - have played on artificial turf without any physical problem.” Many of the online comments from CFF supporters inspired by the Nevius column had to be removed for being overly aggressive in tone toward dissenters.